Anti-Croat sentiment (Croatophobia or Anti-Croatism) is discrimination or prejudice towards Croats as an ethnic group, and towards Croatia as a country. Anti-Croat sentiment was – and still is – especially present among some Serbs, starting in the 19th century. With the nation-building process in mid-19th century, first Croatian-Serbian tension appeared. Serbian minister Ilija Garašanin's Načertanije (1844):3 claimed lands that were inhabited by Bulgarians, Macedonians, Albanians, Montenegrins, Bosnians, Hungarians and Croats were part of Serbia. :3 Garašanin's plan also includes methods of spreading Serbian influence in the claimed lands. :3–4 He proposed ways to influence Croats, who Garašanin regarded as "Serbs of Catholic faith". :3 This plan considered surrounding peoples to be devoid of national consciousness. :3–4:91 Vuk Karadžić in the 1850s then denied the existence of Croatians and Croatian language, counting them as "Catholic Serbs". Croatia was at the time a kingdom in Habsburg Monarchy, with Dalmatia and Istria being separate Habsburg Crown lands. Ante Starčević, head of the Croatian Party of Rights, advocated for Croatia as a nation. After Austro-Hungary occupied Bosnia and Herzegovina in 1878 and Serbia gained its independence from Ottoman Empire, Croatian and Serbian relations deteriorated as both sides had pretensions on Bosnia and Herzegovina. In 1902 there was a reprinted article written by Serb Nikola Stojanović that was published in the publication of the Serbian Independent Party from Zagreb titled Do istrage vaše ili naše (Till the Destruction, ours or yours) in which denying of the existence of Croat nation as well as forecasting the result of the "inevitable" Serbian-Croatian conflict occurred. —  Nikola Stojanović, Srbobran, 10.08.1902. During the 19th century, some Italian radical nationalists tried to promote the idea that a Croatian nation has no sound reason to exist: therefore the Slavic population on the east coast of the Adriatic Sea (Croats and Slovenes) should be Italianized, and the territory included in Italy. In World War I, 8,579 male "aliens of enemy nationality" were interned, including 5,954 Austro-Hungarians, including ethnic Croats. Many of these internees were used for forced labour in internment camps, such as the Castle Mountain Internment Camp and the Eaton Internment Camp. This law was primarily aimed at further restricting immigration of Southern Europeans and Eastern Europeans, especially Italians, Slavs (including Croats) and Eastern European Jews. Fascist-led Italianization, or the forced assimilation of Italian culture on the ethnic Croat communities inhabiting the former Austro-Hungarian territories of the Julian March and areas of Dalmatia, as well as ethnically-mixed cities in Italy proper, such as Trieste, had already been initiated prior to World War II. The Anti-Slavic sentiment, perpetuated by Italian Fascism, led to the persecution of Croats, alongside ethnic Slovenes on ethnic and cultural grounds. A leaflet from the period of Fascist Italianization prohibiting singing or speaking in the "Slavic language" in the streets and public places of Dignano (now Vodnjan, Croatia). Signed by the Squadristi (blackshirts), and threatening the use of "persuasive methods" in enforcement. This period of Fascist Italianization included the banning of the Croatian Language in administration and courts between 1923 and 1925, the Italianization of Croat given and surnames in 1926 and the dissolution of Croatian societies, financial co-operatives and banks. This period was therefore characterised as "centralising, oppressive and dedicated to the forcible Italianisation of the minorities"  consequently leading to the emigration of around 105,000 Slovenes and Croats from the Julian March, mostly to the Kingdom of Yugoslavia (around 70,000), but also to Argentina (some 30,000). On the other hand, several thousand Dalmatian Italians moved from Yugoslavia to Italy after 1918, many of them to Istria and Trieste. Following the Axis Invasion of Yugoslavia in April 1941, Italy occupied almost all of Dalmatia, as well as Gorski Kotar and the Italian government made stringent efforts to further Italianize the region. Italian occupying forces were accused of committing war crimes in order to transform occupied territories into ethnic Italian territories.. An example of this was the 1942 massacre in Podhum and Testa, when Italian forces murdered at least 108 Croat civilians and deported the remaining population to concentration camps. 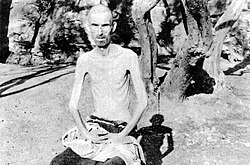 An emaciated male inmate suffering from severe malnutrition at the Italian Rab concentration camp, which largely detained Slavs, on the island of Rab in what is now Croatia. The basic precondition for creating an ethnically clean area was the securing of a pure Serbian ethnic state and the ethnic cleansing of the area inhabited by Croats and Bosniaks. Ustase lead massacres of Serb civilians accelerated Chetnik cleansings in the Bosnia region leading to more volunteers in the Chetnik army. Similarly, Chetnik atrocities lead to larger Ustase volunteers. (...) 2) Regarding our internal affairs, the demarcation with the Croats, we hold that we should as soon as an opportunity occurs, gather all the strength and create a completed act: occupy territories marked on the map, clean it before anyone pulls itself together. We would assume that the occupation would only be carried out if the main hubs were strong in Osijek, Vinkovci, Slavonski Brod, Sunja, Karlovac, Knin, Šibenik, Mostar and Metković, and then from within start with an [ethnic] cleansing of all non-Serb elements. The guilty should have an open way - Croats to Croatia, Muslims to Turkey (or Albania). As for the Muslims, our government in London should immediately address the issue with Turkey. English will also help us. (Question is!). The organization for the interior cleansing should be prepared immediately, and it could be because there are many refugees in Serbia from all "Serb lands" (...). It is clear from the documents of the Chetnik commanders that the real reason for the terror against the non-Serb population was the desire to establish an ethnically pure Greater Serbia in the historical territory of many peoples, most notably Croatian, Muslim, but also Bulgarian, Romanian, Hungarian, Macedonian, Montenegrin and others and not crimes over the Serbs in NDH as Chetniks officially claimed. Draža Mihailović went even further from Moljević and requested more than 90% of the NDH's territory where more than 2,500,000 Catholics and more than 800,000 Muslims lived, accounting for about 70% of the total population with Orthodox Serbs making up only about 30% of the population. In the context of Chetnik genocide, one of the main Chetnik commanders Milan Šantić stated in Trebinje in July 1942: "The Serb lands must be cleansed from Catholics and Muslims. They will be inhabited only by the Serbs. Cleansing will be carried out thoroughly, and we will suppress and destroy them all without exception and without pity, which will be the starting point for our liberation." In the "Elaborate" of the Chetnik's Dinaric Battalion from March 1942, it's stated that Chetnik's main goal was to create a "Serbian national state in the areas in which the Serbs live, and even those to which Serbs aspire (Bosnia and Herzegovina, Lika and part of Dalmatia)" where "only Orthodox population would live". It is also stated that Bosniaks should be convinced that Serbs are their allies, so they wouldn't join the Partisans, and then kill them." According to Bajo Stanišić, the final goal of the Chetniks was "founding of a new Serbian state, not a geographical term but a purely Serbian, with four basic attributes: the Serbian state [Greater Serbia], the Serb King [of] the Karađorđević dynasty, Serbian nationality, and Serbian faith. The Balkan federation is also the next stage, but the main axis and leadership of this federation must be our Serbian state, that is, the Greater Serbia." Chetnik ethnic cleansing targeted Croat civilians throughout areas of Croatia and Bosnia and Herzegovina, in which Croats were massacred and expelled, some examples of which include: Krnjeuša massacre, Trubar massacre, Bosansko Grahovo massacre and the Gata massacre. According to the Croatian historian, Vladimir Žerjavić, Chetnik forces killed between 18,000-32,000 Croats during World War II, predominantly civilians . A Serb flyer used during the Yugoslav Wars, calling upon all citizens of Dubrovnik to cooperate with the JNA against the Croats' "vampired fascism and Ustašism"
After Serbian President Slobodan Milošević's assumption of power in 1989 various Chetnik groups made a "comeback" and his regime "made a decisive contribution to launching the Chetnik insurrection in 1990–1992 and to funding it thereafter". Chetnik ideology was influenced by the memorandum of the Serbian Academy of Sciences and Arts. On 28 June 1989, the 600th anniversary of the Battle of Kosovo, Serbs in north Dalmatia, Knin, Obrovac, and Benkovac where there were "old Chetnik strongholds" held the first anti-Croatian government demonstrations. On the same day, Chetnik commander from WWII Momčilo Đujić declared Vojislav Šešelj "at once assumes the role of a vojvoda and a vladika [high-ranking religious order] unifier" and ordered him "to expel all Croats, Albanians, and other foreign elements from holy Serbian soil", stating he would return only when Serbia was cleansed of "the last Jew, Albanian, and Croat". The Hague Tribunal found that about 170,000 Croats were expelled from parts of Croatia, Serbian forces sought to control. Rebel Croatian Serbs' forces together with Serbian military and paramilitary forces committed numerous war crimes and massacres in Republic of Croatia. According to the Croatian Association of Prisoners in Serbian Concentration Camps, a total of 8,000 Croatian civilians and Prisoners of war (a large number after the fall of Vukovar) went through Serb prison camps such as Sremska Mitrovica camp, Stajićevo camp, Niš camp and many others where many were heavily abused and tortured. A total of 300 people never returned from them. A total of 4,570 camp inmates started legal action against former Serbia and Montenegro (now Serbia) for torture and abuse in the camps. From territories occupied by Serbs in 1991, around 700,000 people were expelled or fled. 16,000 Croats (43.4% civilians) were killed during the war, largely through massacres and bombings. Croatia regained control over most of occupied territories in 1995. Croatian home in Republika Srpska defaced with graffiti which includes the Serbian cross, "Red Star champion", "Usraše se Ustaše" and "God protects Serbs"
Vojislav Seselj, a radical Serbian nationalist, is a major proponent of a Greater Serbia with no ethnic minorities, but “ethnic unity and harmony among Orthodox Serbs, Catholic Serbs, Muslim Serbs and atheist Serbs". In late 1991, during the Battle of Vukovar, Šešelj went to Borovo Selo to meet with a Serbian Orthodox Church bishop and publicly described Croats as a genocidal and perverted people. In May and July 1992, Šešelj visited the Vojvodina village of Hrtkovci and publicly started the campaign of persecution of local ethnic Croats. Incidents occurred on 4 November 2015 during the Olympiakos-Dinamo Zagreb soccer match. The Greek fans mixed with Delije supporters displayed chetnik symbols and recited slogans as "Kill the Croatian so the Albanian doesn't have a brother". The Croatian side protested to the referee and refused to play until the symbols were removed. In an interview with Telegraf.rs 2012 Jovan Pejin, historian and former director of the Historical Archive of Serbia, declares that "The genocidal Croats are the most primitive people in Europe ... Croatians are mostly former Serbs who separated, and as Czechs, Poles, Russians, who are themselves divided, into one nation. Croatia is an artificial creation, and everything they have achieved so far have done so on the basis of lies ... Croats speak the Serbian language, even though they only corrupt it and make it a monstrosity, and out of it is simple to conclude that they speak a perverted Serbian language ". German left-wing philosopher Ernst Bloch described as "Kroaten als Faschisten, oder als zumindest Halbfaschisten" (Croats as fascists, or at least as semi-fascists) in an interview in 1975 for political weekly "Der Spiegel" (Der Spiegel, 6,29. Jahrgang, 03/02/1975., str. 80). In the media interviews 2012, the famous American singer-songwriter Bob Dylan said: "If you got a slave master or [Ku Klux] Klan in your blood, blacks can sense that. That stuff lingers to this day. Just like Jews can sense Nazi blood and the Serbs can sense Croatian blood." A legal complaint has been lodged over Dylan's remark by a Croat association in France. In the article "Save us God of Plague, Hunger and the Croats - Ustasha mentality is as old as themselves" published in early 2014 in Intermagazin.rs, author uses - as the thruth - the writing of the Chetnik propagandist Laza M. Kostić published in USA in 1950-es: the author says (2014) it is proven the "killer mentality" is routed in Croats for centuries. In a May 2012 interview, the then President of Serbia, Tomislav Nikolić, was quoted by Frankfurter Allgemeine Zeitung to have said that ″Vukovar was a Serb city and Croats have nothing to go back to there″. Croatian President Ivo Josipović criticized Nikolić for this statement and conditioned future cooperation on Nikolić's withdrawal of the statement. Ustaše: Derogatory slur used primarily by Serbian nationalists in reference to the Independent State of Croatia and the Ustaše movement during World War II. ^ a b c d e Cohen, Philip J.; Riesman, David (1996). Serbia's Secret War: Propaganda and the Deceit of History. Texas A&M University Press. ISBN 0-89096-760-1. ^ Anzulovic, Branimir (2001). Heavenly Serbia: From Myth to Genocide. New York University Press. ISBN 1-86403-100-X. ^ "The Immigration Act of 1924 (The Johnson-Reed Act)". U.S Department of State Office of the Historian. Retrieved 2012-02-13. ^ Murrin, John M.; Hämäläinen, Pekka; Johnson, Paul E.; Brunsman, Denver; McPherson, James M. (2015). Liberty, Equality, Power: A History of the American People, Volume 2: Since 1863. Cengage Learning. ^ Verginella, Marta (2011). "Antislavismo, razzismo di frontiera?". Aut aut (in Italian). ISBN 9788865761069. ^ Mennecke, Martin (2012). "Genocidal Violence in the Former Yugoslavia". In Totten, Samuel; Parsons, William S. Centuries of Genocide: Essays and Eyewitness Accounts. New York: Routledge. ISBN 978-0-415-87191-4. ^ Milazzo, Matteo J. (1975). The Chetnik Movement & the Yugoslav Resistance. Baltimore: Johns Hopkins University Press. ISBN 978-0-8018-1589-8. ^ Mitrović, Andrej (2007). Serbia's Great War, 1914–1918. West Lafayette: Purdue University Press. ISBN 978-1-55753-476-7. Mojzes, Paul (2011). Balkan Genocides: Holocaust and Ethnic Cleansing in the 20th Century. Lanham, Maryland: Rowman & Littlefield. ISBN 978-1-4422-0665-6. ^ Pajović, Radoje (1977). Kontrarevolucija u Crnoj Gori: Četnički i federalistički pokret 1941–1945 (in Serbo-Croatian). Cetinje, Yugoslavia: Obod. ^ Simons, Marlise (10 October 2001). "Milosevic, Indicted Again, Is Charged With Crimes in Croatia". New York Times. Retrieved 21 April 2011. ^ "Prosecution submission of an expert report of Reynaud J.M. Theunens pursuant to Rule 94bis" (PDF). The Hague: The International Criminal Tribunal for the Former Yugoslavia. December 16, 2003. p. 27633-27630, 27573 & 27565-27561. Retrieved 10 May 2011. ^ Natalya Clark, Janine (2014). International Trials and Reconciliation: Assessing the Impact of the International Criminal Tribunal for the Former Yugoslavia. ISBN 9781317974741. ^ "Danijel Rehak ponovno izabran za predsjednika Hrvatskog društva logoraša". Vjesnik (in Croatian). 28 March 2004. Archived from the original on 30 April 2004. Retrieved 5 October 2010. ^ "Granice (srpske)". Biografija: Pojmovnik (in Serbian). Vojislav Šešelj official website. April 1992. Retrieved 21 December 2012. Srpske granice dopiru do Karlobaga, Ogulina, Karlovca, Virovitice. ^ UNHCR (August 5, 2005). "Home again, 10 years after Croatia's Operation Storm". UNHCR. Retrieved November 24, 2017. ^ index (December 11, 2003). "Utjecaj srbijanske agresije na stanovništvo Hrvatske". Index.hr. Retrieved November 24, 2017. ^ "Vojislav Seselj: I Wanted a 'Greater Serbia'". Balkan Insight. Retrieved 28 March 2016. ^ "Tifozët grekë e serbë brohorasin "Vrite kroatin, që shqiptari mos të ketë vëlla"" [The Greek fans: "Kill the Croatian so the Albanian does not have a brother"] (in Albanian). TV Koha. 2015-11-05. Retrieved 2015-11-20. ^ "INTERVJU, ISTORIČAR JOVAN PEJIN: Hrvati su genocidan narod, najprimitivniji u Evropi! ", Telegraf.rs, 21.03.2012. ^ Sačuvaj nas Bože, kuge i Hrvata, Antihrvatski komitet u Beogradu, Zagreb 2010. ^ "Novi srbijanski predsjednik Tomislav Nikolić: Vukovar je bio srpski grad i Hrvati se nemaju zašto vraćati u njega", Jutarnji.hr, 24 May 2012; retrieved 27 March 2013. ^ "Josipović: 'Saradnja moguća ako Nikolić promeni stavove'", Pressonline.rs, 26 May 2012; retrieved 27 March 2013. "The U.S. Media and Yugoslavia, 1991-1995" (book), James J. Sadkovich, Greenwood Publishing Group, 1998. This page was last edited on 26 March 2019, at 07:35 (UTC).